HostBooks GST software provides you with the best GST Billing and Return Filing experience. We aim at reducing the compliance time significantly which will consequently cut down the cost by half. 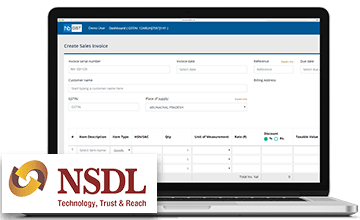 Being Cloud-based with Anytime Anywhere Access, NSDL Listed Software, HostBooks GST will always be by your side and help you achieve all your GST endeavors. Ease your burden with a hassle-free process of filing GSTR-1, GSTR-1A, GSTR-3B, and GSTR-4 online with HostBooks GST return filing software. We further strive to simplify the process with easy reconciliation of invoice mismatches, automatic data validation, inbuilt HSN/SAC codes, and tax liability updates. Generate invoices/bills as per the statutory guidelines with HostBooks GST billing software, which facilitates customized industry-specific GST billing. We help you focus on your core business activities by taking care of GST tax calculation, preparation of comprehensive business reports and inventory control. Also, HostBooks GST billing software enables you to print or email invoices as per your requirements. Every business registered under Goods and Services Tax must file a monthly/quarterly return of sales or outward supplies, known as GSTR-1. By filing this return, every taxpayer makes a declaration of all the sales transactions made by him in the given period. What is the due date for filing GSTR-1? The due date to file GSTR-1 is 11th of the succeeding month (monthly filing) or end date of the following month succeeding the relevant quarter (quarterly filing). For example, GSTR-1 for the month of January 2019 will be 11th February 2019 in case of monthly filing and for the quarterly filing, the due date will be 30th April 2019 for the Jan-March 2019 quarter. What is the late fee and penalty for GSTR-1? Late Fee for not filing GSTR-1 is ₹ 100 per day of delay (₹ 50 as per the CGST Act and ₹ 50 as per the SGST Act. The late fees will be charged from the date after the due date. Late Fee for not filing GSTR-1 is ₹ 200 per day of delay (₹ 100 as per CGST Act and ₹ 100 as per the SGST Act. The late fees will be charged from the date after the due date. However, currently, the late fee has been reduced to ₹ 50 per day (tax return) and ₹ 20 per day (for nil return). What are the common issues faced while filing GSTR-1? What should be done if one receives an error “You have no summary to submit GSTR-1”? This message pops up if one has a nil return. Please make sure you are putting in 0 in all the fields and file again. I am not able to select an earlier date (Nov 1) for an invoice. What should I do? The date mentioned in the invoice comes before the customer’s GST registration date. 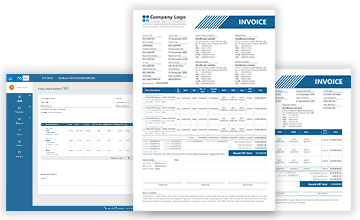 Move the invoices to B2C section and delete the customer’s GSTIN mentioned in these invoices. Then, re-compute B2C summary followed by re-uploading to the Govt. portal. Please note that your customer will not be able to get an input tax credit in such cases since they were not registered under GST for those invoice dates. I am getting an error “Invalid GSTIN ’08AABCM*****1ZO’”. What does this mean? This error means that you have entered incorrect GSTIN of your customer. You need to check the GSTIN on the government website. It is an amendment form used to correct the GSTR-1 for any mismatches between the GSTR-1 of a taxpayer and the GSTR-2 of his customers. What is the due date for filing GSTR-1A? The due date to file GSTR-1A is between 15th and 17th of the following month. For example, GSTR-1A for October has to be accepted/rejected between 15th to 17th November. What are the common issues faced while filing GSTR-1A? Can a supplier add any detail in GSTR-1A? No, the supplier cannot add any detail in GSTR-1A. Is it compulsory to submit GSTR-1A before generation of GSTR-3? GSTR-1A is not mandatory to be submitted before the generation of GSTR-3. When can a taxpayer start taking action on auto-populated details in his GSTR-1A and submit it? This can be done after the expiry of the due date for GSTR-2, i.e. 15th of the subsequent month or any other notified date. Submit button is not enabled to submit GSTR-1A. What should I do? After selecting the checkbox for acknowledgment, the SUBMIT button will be enabled. Can I make changes to the invoices after submitting GSTR-1A? You cannot make any changes to the invoices once you submit GSTR-1A. This is a monthly self-declaration to be filed by a registered dealer. GSTR-3B has been introduced by the Govt. to ease out the burden of the taxpayers. In this return, the taxpayer has to furnish the total values for each field. What is the due date for filing GSTR-3B? GSTR-3B is to be filed on 20th of the following month. For example, the GSTR-3B for the month of Nov 2018 will be 20th Dec 2018. What is the late fee and penalty for GSTR-3B? An interest @ 18% per annum is payable on the amount of outstanding tax to be paid. What are the common issues faced while filing GSTR-3B? I have no sales or purchase this month. Should I still file GSTR-3B? Yes, GSTR-3B has to be filed by every registered person even if there are no transactions in a month. Should I provide invoice wise details on the return? Not required as only consolidated numbers are required in GSTR-3B. Is there any invoice matching in GSTR-3B? No, invoice matching is there in GSTR-3B. This return is more of a self-declaration. Do I need to file GSTR-1, GSTR-2 & GSTR-3 even after filing GSTR-3B? GSTR-1 has to be filed on a monthly or a quarterly basis depending on the turnover limit. Due dates and filing of GSTR-2 and GSTR-3 will be worked out by the GST Council soon. GSTR-3B is to be filed every month. It is a quarterly return for those who have registered themselves under the GST Composition Scheme. The entities which have a turnover up to 1 crore INR are eligible for this scheme. Under the composition scheme, the taxpayer is required to file one return every quarter instead of three returns every month. The due date for filing GSTR 4 is 18th of the month after the end of the quarter. For example, the due date for the quarter April to June 2018 will be 18th July 2018. What is the late fee and penalty for GSTR-4? A penalty of ₹ 200 per day is levied if the GSTR-4 is not filed. The maximum penalty that can be charged is ₹ 5,000. In case the GSTR-4 is not filed for a given quarter, then the taxpayer cannot file the next quarter’s return. According to Notification No. 73/2017 – Central Tax, late fees for GSTR-4 has been reduced to ₹ 50 per day of default. And for NIL return, the same has been reduced to ₹ 20 per day of delay. What are the common issues faced while filing GSTR-4? Where all the B2B transactions should be declared? B2B transactions of a Composition Dealer are not required to be declared in GSTR-4 for July-Sept and Oct-December return. Can filed GSTR-4 be revised? There is no provision for revising GSTR-4. One needs to thoroughly review ones GSTR-4 before filing. Why should I declare reverse charge transactions in my GSTR-4? RCM on purchase from unregistered dealers has been put on hold from 13th Oct 2017. How HostBooks GST software makes GST Billing and Return Filing easy for you? Why choose HostBooks GST Software? HostBooks GST billing and filing software is an NSDL Listed Software. Hence, we are committed to ensuring a seamless GST billing and return filing experience for the taxpayers to overcome the GST challenges. HostBooks GST software has been crafted with the latest cloud technology that provides you an anytime anywhere access. Simply put, HostBooks GST cloud solution enables you to easily access and manage your account anytime from any corner of the world. HostBooks GST software automatically calculates the ITC along with the tax liability. It not only saves your valuable time but also increases your efficiency by reducing the manual efforts by almost half and by ensuring accuracy. With HostBooks GST Billing software all your GST billing requirements will be met. Be it any industry, customized billing will be carried out as per the needs of the business. Hence, you have your bills the way you want. A mismatch in the invoices can be really troublesome. And, correction of these mismatches may sometimes cost a fortune. 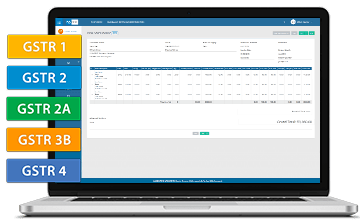 Hence, HostBooks GST accounting software helps you with invoice reconciliations in a cost-effective manner and makes your job stress-free. HostBooks GST billing and return filing software automatically validates the data for any errors and highlights the same right away. It also validates the GSTIN of the suppliers. So, with automatic data validation, you are already half-way through in your job. HostBooks GST software facilitates easy data migration from Tally or any other software that you might be using currently. Simply put, all the details will be migrated in its original form with no data loss. With HostBooks GST, you can import as well as export the files from your system instantly irrespective of its size. Hence, it simplifies the process of uploading data while filing the GST returns online. The automated bank feeds in our GST software fetches all the required information with respect to bank statements and hence eases out your burden. Also, it has been linked with all the secured payment gateways. HostBooks GST software provides you with, TLS 1.2 Transport Security with AES 256 bit encryption (HTTPs at SSL Level) to keep your data safe and secure. It also offers easy backup and restoration of all your data. Our team of competent CAs is just a call away to assist you on any GST related query. And, in case you are having trouble while filing your GST returns, the team will be at your service right away. Get yourself registered under GST in just a few clicks with HostBooks GST! Current status of GST application/GST registration through GST ARN (Application Reference Number). Expert assistance round the clock from filing an application until you get registered. Regular updates from GST experts on successful submission of GST documents, GST ARN acknowledgment, etc. GST registration plan that best suits your business requirements in all respects. Save yourself from a penalty of 100% of the tax amount due. 1What are the other types of Returns under Goods and Services Tax? GSTR-2 is a monthly return of purchases or inward supplies. It contains the information that is furnished through returns in forms GSTR-1 and GSTR-2, based on other liabilities of previous tax periods. Part-A is generated electronically. It contains the tax liability, interest, penalty, and refund claimed from cash ledger. Also, it is auto-populated. The tax liability is calculated based on GSTR-1 and after making adjustments for Input Tax Credit claimed in GSTR-2. This is the tax notice issued by the tax authority to a defaulter who fails to file monthly GST returns on time. Quarterly purchase-related tax return for composition dealers. It’s automatically generated by the GSTN portal based on the information furnished in the GSTR-1, GSTR-5, and GSTR-7 of your suppliers. A variable return for Non-Resident foreign taxpayers. It contains the details of the taxpayer, period of return and invoice details of all goods and services sold and purchased by the taxpayer in India for the registered period. It is a monthly return for Input Service Distributors (ISD). This return contains the details of the taxpayer, period of the return, supply details from the GSTR-1 of counter-parties, invoice details, separate ISD ledger containing the opening ITC balance for the period, credit for ITC services received, debit for ITC reversed or distributed, and closing balance. GSTR-7 is a monthly return for TDS transactions. It contains the basic information of the taxpayer, period of the return, supplier’s GSTIN, invoices against which the tax has been deducted (SGST, CGST, and IGST), and details of any other payment such as interests and penalties. A monthly return for e-commerce operators. It contains the basic information of the taxpayer, the period of the return, details of supplies made to customers through the e-commerce portal by both registered taxable persons and unregistered persons, customers’ basic information, the amount of TCS, tax payable, and tax paid. This is an annual return where the taxpayer has to make a declaration of all the monthly supplies made by him. Simply put, GSTR-9 is a consolidated return that contains all the transactions done in that particular financial year consolidated tax return that includes a summary of taxpayer’s income & expenditure in detail. GSTR-9A is a consolidated annual return filed by the dealers under the composition scheme. It includes all the quarterly returns filed by the composition dealers in that financial year. This return is filed by the e-commerce operators who has earlier filed GSTR-8 during that particular financial year. GSTR-9C is an annual return and is filed by those taxpayers whose annual turnover exceeds the limit of ₹ 2 crores. This return is also known as the audit form. Such taxpayers also need to get their accounts audited and are supposed to file a copy of the audited annual accounts, reconciliation statement of tax already paid along with tax payable as per audited accounts. The final GST return for the cancellation of GST registration. This return is to be filed in case of termination of business activities permanently/cancellation of GST registration. It contains the details of all supplies, liabilities, tax collected, tax payable, etc. Variable tax return for taxpayers with UIN. GSTR-11 contains the details of purchases made by foreign embassies and diplomatic missions for self-consumption during a particular month. 2What are the due dates for GST return filing? Details of inward supplies of taxable goods and/or services claiming the input tax credit. Monthly return on the basis of finalization of details of outward supplies and inward supplies along with the payment of the amount of tax. 3 What is the penalty for non-filing or late GST return filing? The late fee for normal returnsGSTR-1, GSTR-3B, GSTR-4, GSTR-5, GSTR-5A & GSTR-6 is ₹ 200 per day of delay. The late fee for NIL returnGSTR-1, GSTR-3B, GSTR-4, GSTR-5, and GSTR-5A is ₹ 100 per day of delay. As per the latest Govt. Notification, the penalty currently has been reduced to ₹ 50 for normal returns and ₹ 20 for NIL returns. However, the penalty is subject to a maximum cap of ₹ 5000/-. In case, a taxpayer fails to file GST return for any month, then the GST return for the next month cannot be filed by him. Further, if a taxpayer fails to file GSTR-2 return on 15thof the following month, then the taxpayer would not be able to file GSTR-3 & GSTR-3B on the 20th. The late filing of GST return results in a cascading effect that leads to heavy fines and penalty. 4What is the interest on late payment of GST due? The GST Composition scheme is an easy and convenient tax scheme for small and medium enterprises. Under this scheme, firms can pay a fixed percentage of their turnover as a tax. They need to file a reduced number of returns compared to normal taxpayers under GST. The floor rate of tax for CGST and SGST shall not be less than 1% (except for specific cases). The turnover of an enterprise up to 1 crore INR and in case of north-eastern states, it should be 75 lakhs INR. Who can avail composition scheme? 6 What are HSN and SAC codes? These codes are allotted to all the goods or services in supply. HSN means “Harmonized System of Nomenclature”, a universally accepted 6-digit uniform code for goods and has been developed by the World Customs Organization (WCO). SAC code is meant for services. In India, we use 8-digit HSN and SAC codes, where the first 2 digits of the code stand for the chapter where the good or service is listed in the Code List. Next 2 digits are the Chapter, followed by 2 digits for the product. Last 2 digits are a classification of the product. HB-GST has inbuilt HSN and SAC codes. 7What happens when a taxable person has not filed GST returns from the date of registration? What is the remedy available? In case, the returns have not been filed for a continuous period of 6 months, the proper officer may cancel the registration of such person as per the provisions of Section 29(2) of CGST Act, 2017 on the issuance of show cause notice. Also, the person should be provided with an opportunity of being heard. The taxpayer will have to furnish a proper reason for the failure to file returns. The officer if satisfied might provide an opportunity to file returns within a specified time frame. 8What is the time limit for claiming ITC? Due date of filing return for the month of the succeeding financial year or the date of filing the Annual Return, whichever is earlier. 9What are the different rates of taxes under GST? 10Who should file Annual Return? The return is to be filed for every financial year on or before 31st December following the end of such financial year. 11How can the amount be utilized in electronic cash ledger? The amount of cash deposited for CGST/SGST/UTGST/IGST/Cess in the electronic cash ledger can be used to make the payment of CGST/SGST/UTGST/IGST/Cess liabilities respectively. Inter-head adjustments are not allowed for major heads. 12If a registered person sells goods to a family member without consideration, is it a supply under GST? According to Schedule I of CGST Act, 2017, the supply of goods or services or both to a related or distinct person without consideration is considered as supply. 13If GSTIN is wrongly mentioned in a particular month’s GSTR-1, can it be corrected? Yes, the GSTIN of an entry made in GSTR-1 of earlier months can be amended. The amendment of B2B entries can be done in table 9A of GSTR-1. Facing issues with GST filing or billing?